I worked as a planning associate with a media planning and advertising company, Adjetter Media Network Pvt Ltd. I gained a good amount of experience in devising digital marketing plan and proposal for various brands. I understood the various aspects of internet marketing and what plays a crucial role in making your brand successful on online platform. Based on the insights from my experience and understanding of internet marketing, I developed following qualitative matrix. It has internet marketing aspects as rows and factors which are critical for success across these aspects as columns. 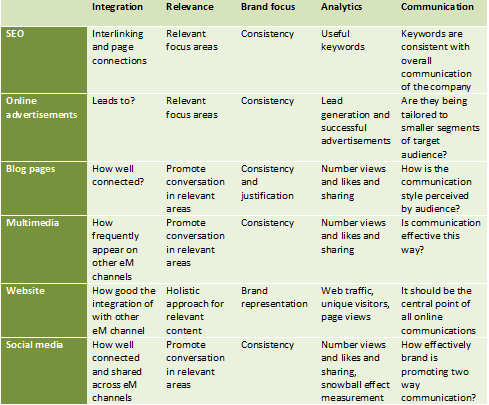 A brand can access its internet marketing portfolio through this simple qualitative matrix. And, it can find out the gaps and opportunities to improve internet marketing strategy. Various factors emphasize on the synergy generated through the consistent approach across the row categories. The idea behind this matrix is to understand the synergy among different aspects of internet marketing like social media, website, ads etc. Therefore the marketing effort is consistent and combined rather than individual and separate. Focus on synergy will decrease effort and maximize gains. Rows: These are the various aspects of internet marketing. Columns: These are some important factors which I found critical for a successful internet marketing strategy based on my understanding of this area. Cells: It describes how a particular aspect is related to the factors appearing in column and what is expected considering these factors as parameters. Integration tries to address how well connected the overall marketing approach is? Is there sufficient interlinking and references among the separate channels and if yes how frequently, the brand utilizes them? Relevance brings out the “Customer Focus” into the marketing strategy across various channels. Brand Focus is something important to address. Every aspect of internet marketing should justify their content on how it is connected with the brand persona and fulfilling its mission. Analytics tries to emphasize that a brand needs to leverage data to understand insights and therefore further improving their strategy. Communication emphasizes the clarity and effectiveness of communication style. How well it is being adopted and appreciated by the target audience. Understanding and measuring the satisfaction level will give us insights on where to improve? Inbound marketing: Why it is so relevant for internet marketers?